When and where can I buy an iPhone? You'll be able to buy one in Apple Retail Stores, Carphone Warehouse and O2 stores from 6.02pm this evening. Can I buy an iPhone online? Yes, after the launch you'll be able to order one from the the O2, Apple and Carphone Warehouse websites. Will Apple sell out of iPhones on UK launch day? Unlikely. Apple says it will keep its stores open on Friday night until every single queuer has got their hands on an iPhone, with many Carphone Warehouse and O2 stores doing the same. The UK's experience is likely to replicate that of the US where the iPhone was launched in June. Although there were queues on launch day everyone who waited for buy an an iPhone got one, and there were still plenty available in subsequent days. What video/audio formats does the iPhone support? Audio formats supported by the iPhone include: AAC, Protected AAC, MP3, MP3 VBR, Audible, Apple Lossless, AIFF and WAV. Supported video formats include: H.264, MP4 and MOV. Does the iPhone's screen scratch easily? 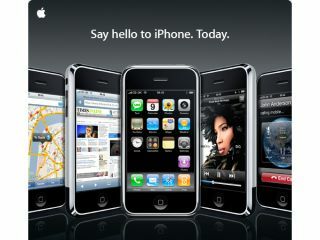 The iPhone's screen is made of glass instead of the plastic used on many phones and MP3 players. This makes the screen extremely robust, and to date there have been very few complaints in the US about the screen. But while the iPhone's screen is extremely tough, it's not 100 per cent scratch-proof, so if you're worried you can always purchase a protective cover. Will the iPhone work as soon as I've bought it? The iPhone will need to be activated before you can use it. While you may find this annoying, most phones and SIM cards take around 24 hours to activate when you start a new contract. Will I be able to unlock my iPhone? There will be no officially sanctioned methods with which to unlock your purchased iPhone. But hackers say they expect to have the device unlocked within minutes of the UK launch. However, we highly recommend that you do not do this. Future firmware updates might make your unlocked iPhone unusable. Can I use my existing number with my new iPhone? Yes. Just like when you switch to any other contract, you'll be able to switch your number across by contacting your current provider and asking them for a PAC code. Will I need to queue in order to get myself an iPhone? On launch day, it's likely that there will be lots of excited people queuing up to get their hands on an iPhone. However, with the promise of lots of stock, you should be able to visit an Apple, O2 or Carphone Warehouse store on Saturday morning and pick up an iPhone without any trouble. Will the iPhone be available on Pay As You Go? Apple and partner O2 currently have no plans to introduce a Pay As You Go (PAYG) iPhone tariff. Does the UK iPhone have 3G and does it matter? The UK iPhone does not have 3G. But it does have EDGE, which is slightly slower. You shouldn't notice the lack of 3G, as the iPhone's WiFi connection will enable you to get online whenever you are in a WiFi hotspot. Is the iPhone keyboard really hard to type on? Some people say yes, other people say no. Safe to say that it gets easier with practise. While the buttons are very close together, the iPhone uses some very clever programming to predict what you're going to type next and so typos are fairly rare. Of the 8GB memory, how much space does the OS take up? The iPhone runs on a stripped down version of Mac OS X which takes up less than 500MB of the handset's 8GB memory. Does the iPhone have Bluetooth? Yes. But you can't use it to synchronize data on the iPhone with your laptop or any other device. You can pair it with a Bluetooth headset, however A2DP is not supported. Can I use my iPhone when I go abroad? Yes, you can use your iPhone abroad just like any other phone. What can I do if my iPhone breaks? The iPhone comes with a limited warranty which covers you for one year. Warranty service for eligible repairs will be provided by Apple for free of charge within 12 months of your original purchase. If you think you mobile phone usage is likely be heavier than that, then you'll have to forego an iPhone and buy something that enables you to use a spare swappable battery. To find out more about the iPhone's battery and how you can get the most from it, check out the dedicated Apple batteries webpage on this subject. Apple UK says you can also get a replacement iPhone battery, should the worst happen, for £55.